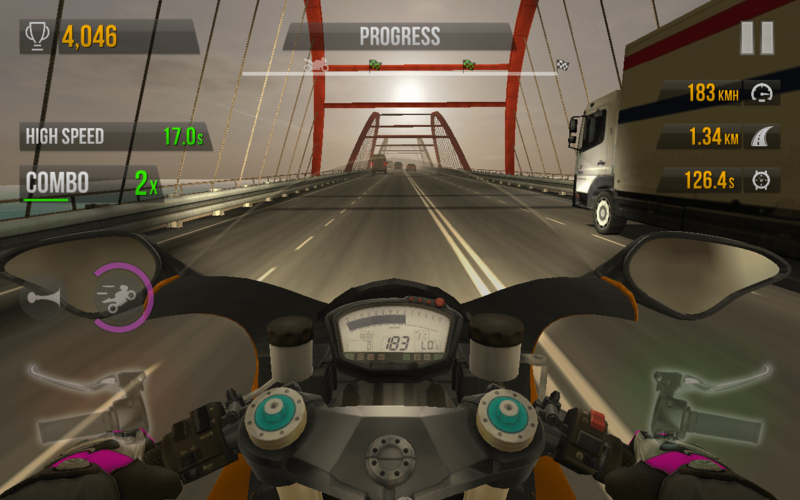 You should know the developer Soner Kara from their previous racing game Traffic Racer, and now they have launched Traffic Rider. Not the catchiest of names, but Traffic Rider is a really good racing mobile game. In fact, it’s one of the best and most addictive in the niche I have played in a while. 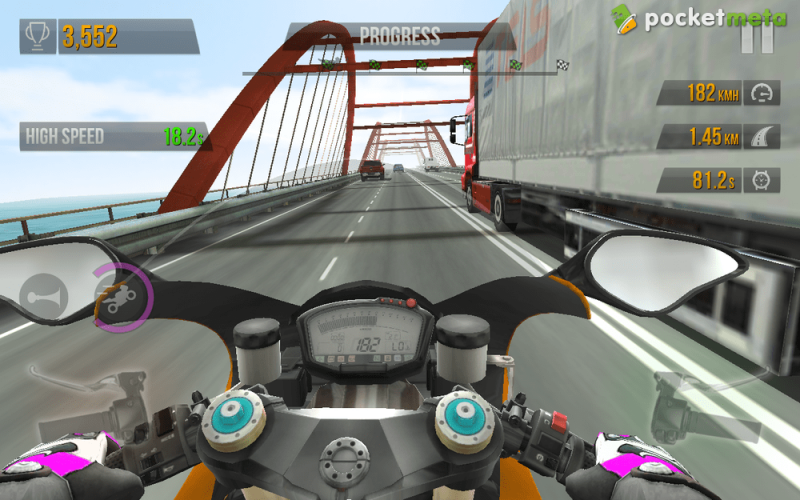 Even though it hast its faults, I quite enjoyed missing out on my life as I played Traffic Rider. Gameplay is where Traffic Rider shines. It’s fast. It’s addicting. It’s incredibly immersing. It has its controls done right. It offers plenty of play modes, areas, bikes and even day to night transition. You can even play free ride with no challenges and 0 traffic if you like. The first-person perspective plays well with the full steam ahead kind of racing that makes me want to turn on Lana Del Rey “Just Ride.” It’s the kind of racing that feels right when you press the throttle button and forget about the brakes. You race along a direct highway, no turns and twists. You can choose between one-way and two-way highways in some modes whereas the Career mode has its own rules. You will die a lot, of course. 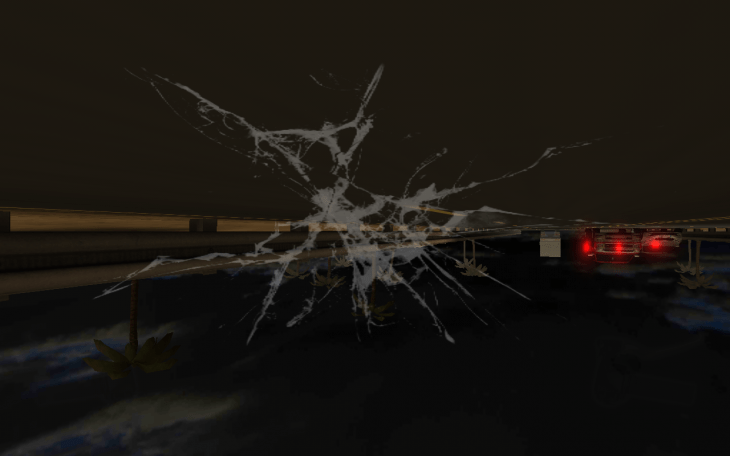 In that, you can choose for the game to display blood on your cracked window, or turn it off if you find it distracting. How can the blood be distracting? The game respawns you when you die. Exactly! No energy system, no limit to the number of re-tries. As long as you are playing a challenge mission and still have the time, you keep respawning. That’s the right approach to get players hooked. The default scheme is tilt, and it works seamless. You can calibrate the sensitivity in the settings and invert the throttle and brake buttons position. You can also switch to the on screen touch controls, but there is no going wrong with the default system. It shines. 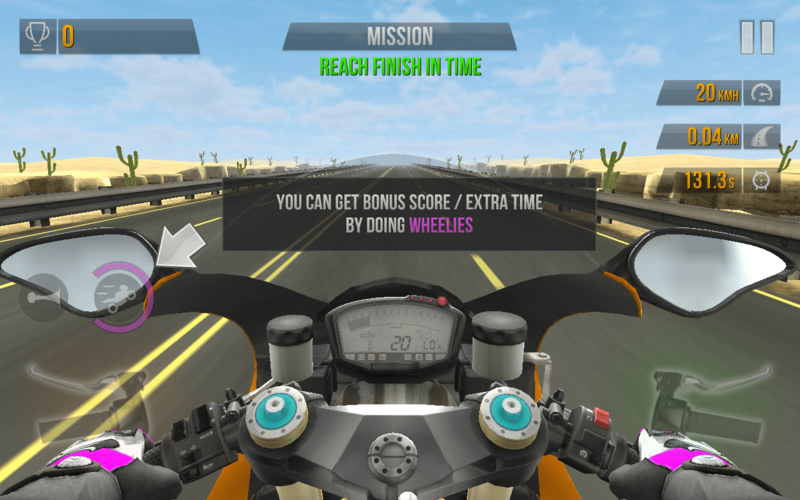 The game has four modes – Career, Endless, Time Trial, and Free Ride. Career has 40 missions, and that’s where you begin because pretty much everything else is unlockable. So, you need to level up as a player to unlock more modes, more day and night scenes, more bikes. In a career mode, you are tasked with completing X number of overtakes within X seconds, or reach the finish line within an X time. As you progress, the missions become harder, so you will eventually need to unlock a new bike. And at some point you will. Each overtake and combo adds seconds to your time limit, so in the end you always play a little more than the set 40 or 60 seconds per mission. After a while, you unlock more control perks, like a wheelie and a horn. Endless mode has one or two-way highways, desert, city and winter scapes, and noon, evening and night settings. The latter two will give you more bonus points. Time trial mode has missions based on well… time, and the same settings as in endless. Free Ride lets you just drive without thinking about the challenges. Choose from one- or two-way traffic, area and time, traffic density percentage and off you go, driving without limits. The Garage has an impressive gallery of bikes, most of which will be locked as you start. Eventually, you will be able to unlock a few more advanced bikes. Some bikes can only be bought for real money. Others for in-game currency you earn by playing. You have a slew of customization options for each bike. You can upgrade the power, handling and braking, paint it a different color, and buy fancy gloves. It would be a hypocrisy to say the free-to-play system is non-intrusive here. It is. You get to watch the ads if you wish to get additional 10 seconds to the run you nearly finished. You get to watch ads just because you must. There is a starter kit worth $7, but I wish it included the best bike. For example, ZZF 1400 costs $10, and it’s in the middle of the model line. Even though you can earn enough in-game cash to unlock and buy a decent bike, the IAPs don’t let you purchase that one premium version of the game where you can just get a fancy bike that would get you all the way through and at least one-way lane in all modes. Instead, you must buy a cash bag and see how you can spend it, provided lots of things are locked into your player level. All those cash and gold packs are meant to milk a tired cow while removing the ads alone is simply not enough to feel the difference between freemium and premium versions of the game. What I am trying to say here is the developer has overcooked the IAP section, and it shows. 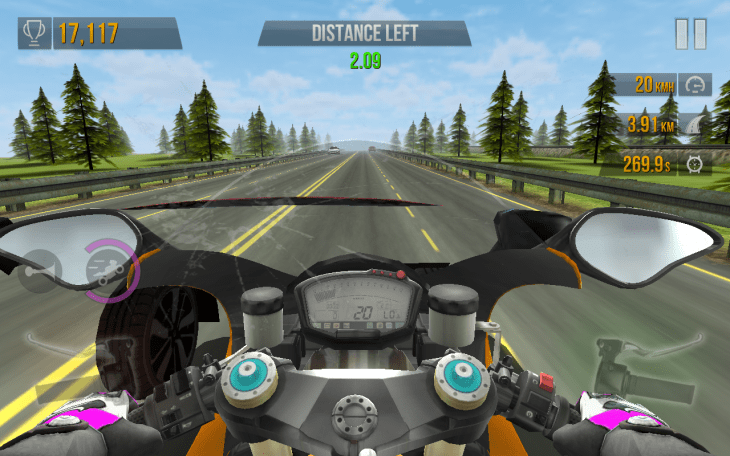 If there is any reason for anyone to quit playing Traffic Rider, it would be the IAPs. It saddens me there is no single premium pack that would deliver the game in all its goodness for a fair price. So that you could hop on and off different modes without the player level limitation, and have one decent bike and a pair of gloves. 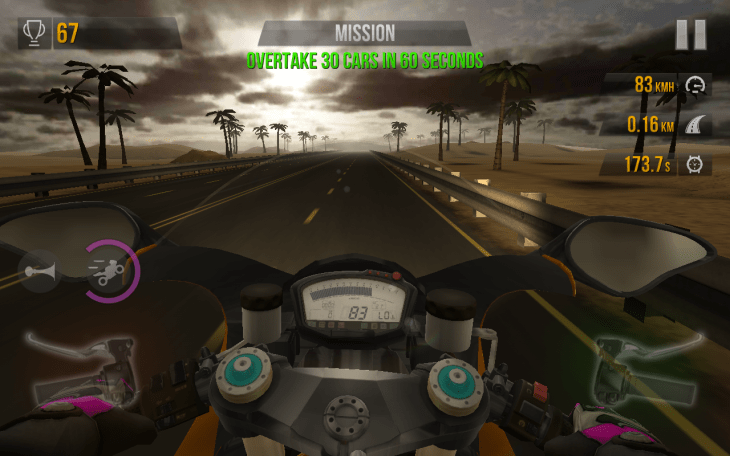 Traffic Rider is a quality racing game, but to unlock all of its content from the get go you will need to pay more than for your usual mobile game. It can be a turn-off for those who shun this Canadian devil attitude. The looks are gorgeous and quite realistic, as in a limited visibility at night, and some gorgeous landscapes at dawn. The cityscapes are beautiful, even though the loop shows when you play it long enough on an endless or free ride mode. The desert is meh. 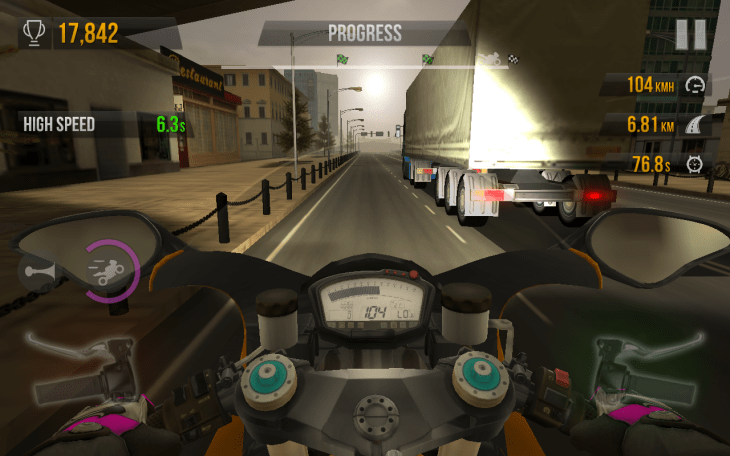 In its entirety, however, Traffic Rider is an engrossing eye candy, and smooth controls paired with first-person perspective and rich graphics deliver the immersion effect. The sounds of bypassing vehicles add more lvelihood while you can turn the music off if it’s not your kind of vibe. Replay value depends on the kind of personality you are. You can grind to get more cash, and you get the cash even if you fail a mission. I see it becoming a favorite snackable time killer for many players, especially because you can play it offline. But I also see some players losing that addiction edge after a week, or so. Traffic Rider is one of the best new first-person motorbike racing games, and it’s worth trying. You can play it for free, with restrictions, but you can gradually unlock many of them. If you are impatient, you will have to figure out the best way to spend your money because the IAP system a little less transparent than it should be, and definitely overpriced at times, and the game lacks a single-purchase premium version. Other than that, it’s a polished and smooth experience with good graphics, fun gameplay and smooth controls. 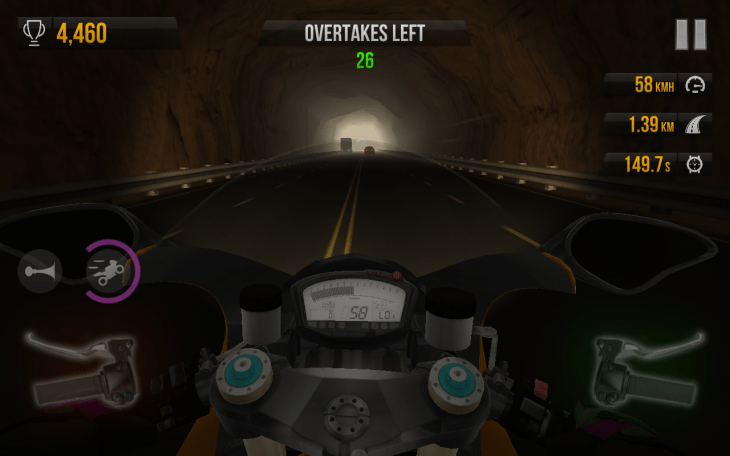 Traffic Rider is a solid bike racing experience, if a bit flawed by a tired IAP approach.